Scouring through the vintage rails at the BOB pop up store on Monmouth St last week had me at HELLO. I mean, well, MY SWEET GOODNESS. 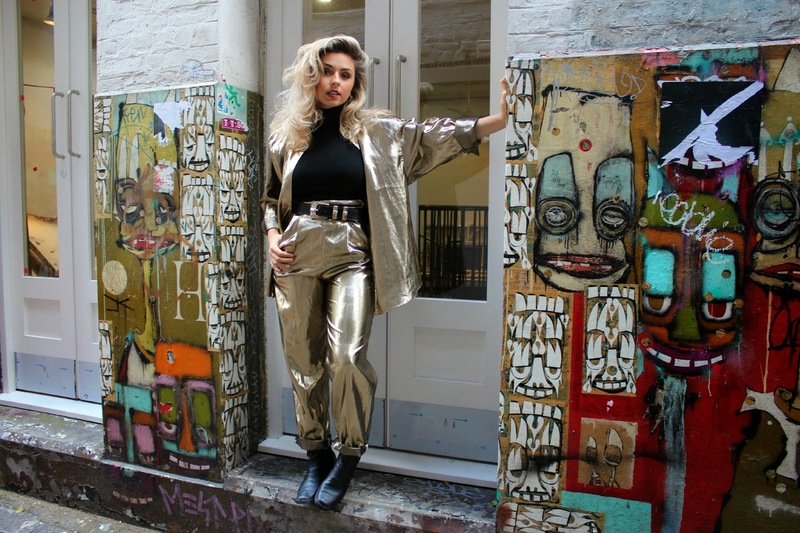 How often do you come across an awesome metallic gold two piece suit? Not often, right? This was so damn shiny and sassy that I just had to slip myself into it. Teaming the gold vibes with black (typical) I loved wearing my staple roll neck and gold western belt. I will be down at the BOB store again on the 1st of June, so come down and try on some vintage finds with me! As well as Dawn's own collection too, the styles are simply fabulous. Thank you to Sophie Richardson who took all of this shots for me!! Did you catch my full vlog on the BOB events? I had SUCH a blast. If not, go check it out by clicking here! I literally don't know anyone else who could pull this off, you look amazing! Such a head-turner! Youuuuuu looking insane! im love with this suit! now THIS is a statement piece! In addition, a few monetary options, require that you simply be reproduced using the exact same organization with regard to a minimum of 3 months or even 3 months. Additional skills contain the amount that you simply help to make monthly.